this Father's Day 2015 weekend workshop. 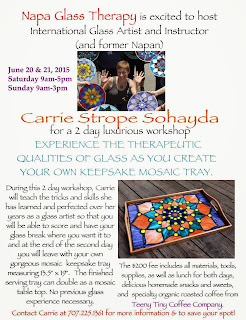 I am so excited to be "coming home" to Napa for a Father's Day weekend workshop in mosaic making! 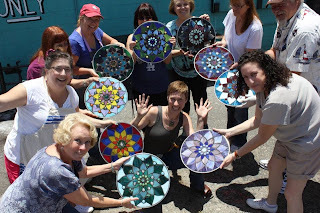 This is going to be a very fun class where we'll complete a luscious wooden serving tray mosaic at a relaxed pace over the course of the weekend. 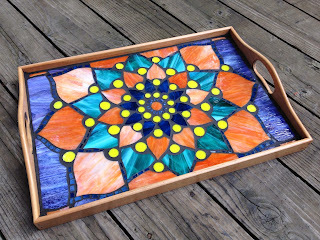 A commissioned mosaic tray made with my signature lotus mandala pattern. 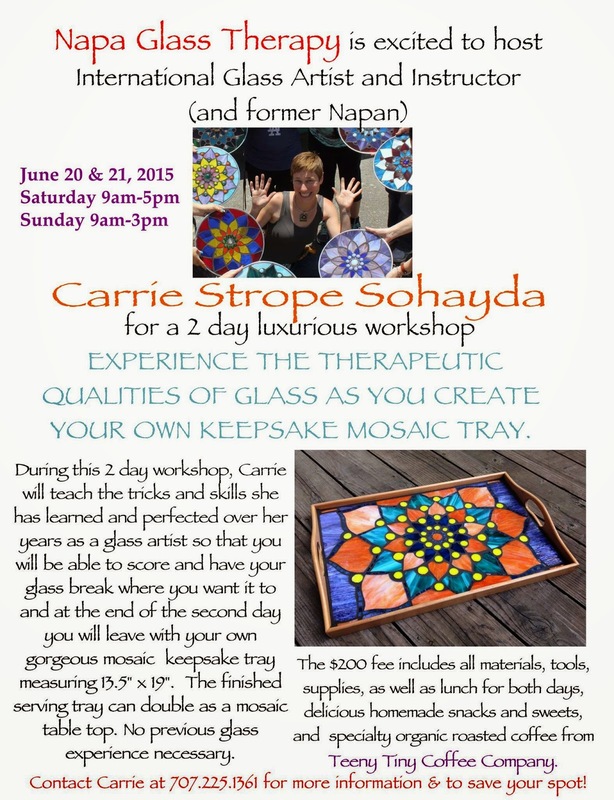 Napa Glass Therapy is excited to host International Glass Artist and instructor Carrie Strope Sohayda for a 2 day luxurious workshop in Napa, California on June 20th and 21st. Experience the therapeutic qualities of glass as you create your own keepsake mosaic tray. During this 2 day workshop, Carrie will teach the tricks and skills she has learned and perfected over her years as a glass artist. earn how easy it is to use No Days Groutless Mosaic Adhesive on wedi board in creating a sturdy wooden serving tray mosaic at a relaxed pace over the course of the weekend. 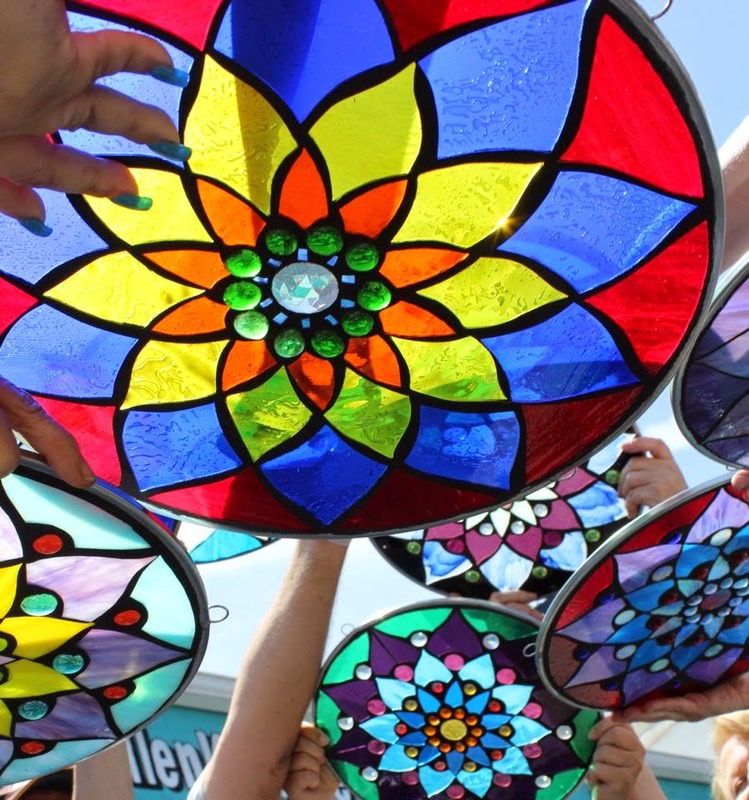 We will discuss basic color theory to help you choose your glass, talk about pattern variations and the best way to approach cutting a pattern out of a sheet of glass, learn tricks for cutting circles and finish with grouting pointers as we complete a mosaic in a weekend. Student projects from a previous class taught in Southern California. Learn how to cut glass so that it breaks where you want it to every time, join in the fun and at the end of the second day, leave with your own gorgeous mosaic keepsake tray measuring 13.5" x 19" serving tray that can double as a small mosaic table top. No previous glass experience necessary! $200 includes all materials, tools, supplies, as well as lunch for both days, delicious homemade snacks and sweets, and specialty, organic, fairtrade roasted coffee to keep you focused! Contact Carrie Strope Sohayda at 707.225.1361 for more information and to save your spot! I hope you'll join us for this great weekend. We always have a blast in my classes! 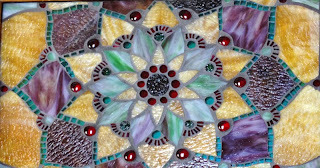 Carrie has been working in glass since 2005 and is enthusiastic about sharing her knowledge with participants. 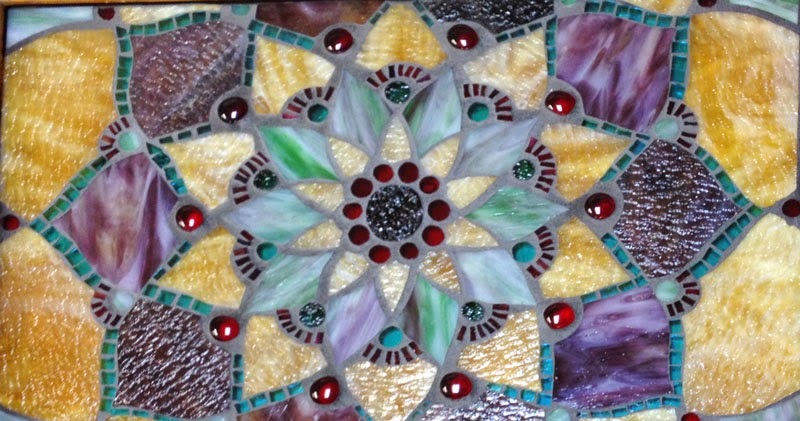 If you've got questions about fused glass or stained glass, she can answer those (or point you in the right direction), as well as all of your mosaic questions. Carrie has experience working with preK-12 students in the classroom with glass and has lots of project ideas that can be adjusted to the capabilities of your students. This is a great class for refining your glass cutting skills. 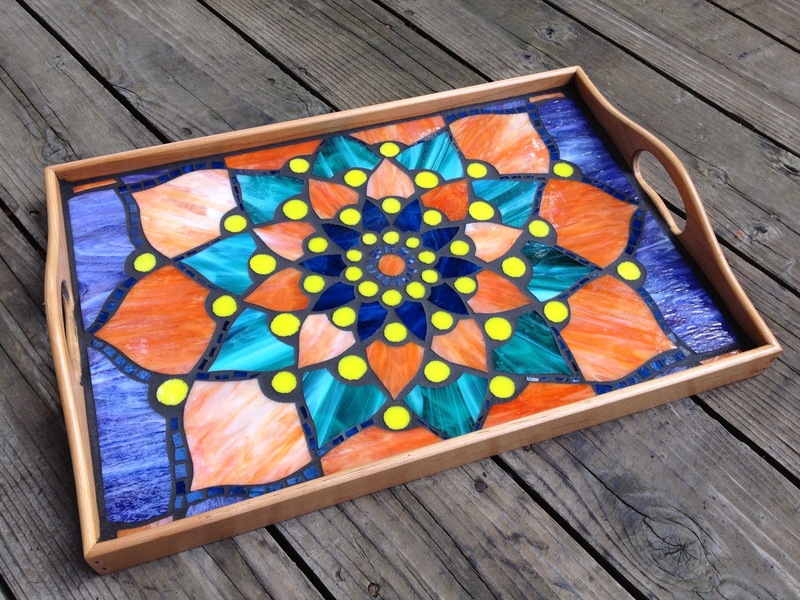 You'll learn how to cut glass so that it breaks where you want it to every time, join in the fun and create a beautiful keepsake 13.5" x 19" serving tray that can double as a mosaic table top. Carrie has several resources for teaching artists and teachers in finding tools and materials for the classroom, as well.